There are 21 Assisted Living Facilities in the Wilsonville area, with 4 in Wilsonville and 17 nearby. The average cost of assisted living in Wilsonville is $3,495 per month. This is higher than the national median of $3,346. To help you with your search, browse the 104 reviews below for assisted living facilities in Wilsonville. On average, consumers rate assisted living in Wilsonville 4.2 out of 5 stars. Better rated regions include Oregon City with an average rating of 4.5 out of 5 stars. Caring.com has helped thousands of families find high-quality senior care. To speak with one of our Family Advisors about assisted living options and costs in Wilsonville, call (855) 863-8283. Wilsonville is a great choice for seniors who want access to a metropolitan area without sacrificing the safety of a smaller community. The city is less than 20 miles from Portland, so Wilsonville assisted living residents are just a short trip away from a variety of services and entertainment options. There are four assisted living facilities located within city limits and 59 others in the surrounding area. These communities are licensed through the Oregon Department of Human Services, Office of Licensing and Regulatory Oversight and can be classified as either assisted living facilities, which have private living quarters, or residential care facilities, which have shared rooms and baths. Wilsonville is great for those who prefer a milder climate. It has an annual low temperature of 36 degrees Fahrenheit in January and an average high of 81 degrees in July. With an average of 41 inches of precipitation each year, the area is perfect for seniors who love the rain. The city receives a crime index score of 45 with a crime rate significantly lower than the national average. When compared to cities of the same size, Wilsonville is found to be safer than most. Seniors on a budget will need to tighten their belts to adjust to the high cost of living in Wilsonville. At just over 50 percent higher than the national average, the area's inflated housing and transportation costs are barely mitigated by the slightly lower costs for heathcare. The area is served by South Metro Area Regional Transit (SMART), with fixed bus routes that cover most of the city. Seniors over the age of 60 can take advantage of reduced fare rates and priority scheduling for the SMART Dial-a-Ride. Wilsonville has few facilities from which to choose in the event of a medical emergency or illness, with the nearest major hospital located in Tualatin, Oregon. Oregon exempts Social Security income from taxation but includes retirement accounts, such IRAs or 401(k)s, under standard income tax rates. The state has no sales tax and offers a property tax deferral for seniors. Assisted Living costs in Wilsonville start around $3,495 per month on average, while the nationwide average cost of assisted living is $4,000 per month, according to the latest figures from Genworth’s Cost of Care Survey. It’s important to note that assisted living rates in Wilsonville and the surrounding suburbs can vary widely based on factors such as location, the level of care needed, apartment size and the types of amenities offered at each community. 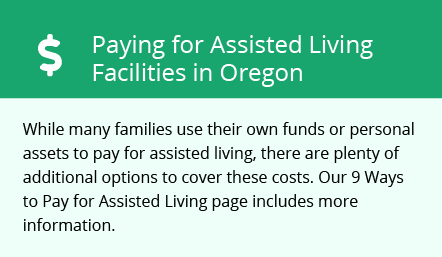 Oregon's Medicaid program has several options available for seniors considering assisted living facilities. Those who require assistance with activities of daily living can participate in the K Plan or one of three HCBS waivers. Wilsonville and the surrounding area are home to numerous government agencies and non-profit organizations offering help for seniors searching for or currently residing in an assisted living community. These organizations can also provide assistance in a number of other eldercare services such as geriatric care management, elder law advice, estate planning, finding home care and health and wellness programs. To see a list of free assisted living resources in Wilsonville, please visit our Assisted Living in Oregon page. Wilsonville-area assisted living communities must adhere to the comprehensive set of state laws and regulations that all assisted living communities in Oregon are required to follow. Visit our Assisted Living in Oregon page for more information about these laws.